I guess I am finally ready to let you all see the kitchen. We have been working on it since late October. For some reason I thought we could paint all the cupboards and wallpaper all the walls before Thanksgiving. Yeah, well, then I thought for sure we would finish by Christmas. So, well, we finally finished the wallpaper and paint by mid-February and have just been doing little things since then. I think for now it is done except for possibly adding a few accessories. I only have one before shot. We started redoing the kitchen before I was blogging and I can't find any other pictures of us in the kitchen at all. I must have avoided any picture taking in here because it was not my favorite room. Imagine 1980's oak cabinets against a badly beat up peach-colored walls and gold hardware all over. 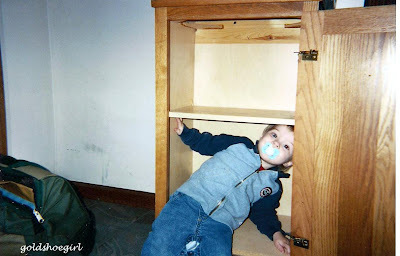 This is my oldest son, who is now 8, playing in the cupboards before we moved into the house. The empty spot next to the cupboard is where the refrigerator is located and the microwave is on top of this cupboard. Notice the oak color of the cabinet. Going into this update we knew we were not going to replace either the white stone countertops or the blue marble floor tile. This redo was done just to get us by until we can afford a total gut job. I hate the blue tile floor and I really want to rearrange the whole layout. In any event, I had to find paint colors that would work with both the blue floor and the white countertop. It was not easy. It was really hard. It was the reason that this was the last room in the house to get updated. I brought home a lot of samples but anything that looked okay with the floor made the white counter look dingy and anything that went with the counter totally clashed with the floor. I started thinking about wallpaper and I must of looked at thousands of samples before we choose this one. It allowed enough contrast that I could have white cabinets on top that didn't clash with the white counters, and it tied in the black bottom cabinets and appliances. Up close the paper has an antiqued crackled type of look that I think goes well with our old house. Here's the cupboard from the before picture. We choose black paint because it went with the appliances. I don't really like the black appliances so having the cabinets match them helps to keep them from being a focal point. Do you see the little owl on the fridge? I made it for my grandmother when I was a girl and when she passed it was given back to me for my fridge. To the right of the fridge is the spot where all the regular life stuff collects. We have hooks for jackets and purses and the basket holds all the phone chargers and miscellaneous stuff. The phone is from Pottery Barn and is only for show. I never had a double oven before this house and now I don't know what I'll do if we move and the new house doesn't have one. I probably only use it once or twice a month but it is so handy to have. Here's a shot of the stovetop and the pendant lights I installed myself. This picture shows the dishwasher that I also painted. You can read how to do that here. This is the window above the sink. We decided to paint the cabinets along this wall white. I didn't want the kitchen to seem super dark and using the white here made all the difference. It helps highlight this wall and brings your eye up. We also replaced all the old gold hardware with new ones in satin nickel - much, much better. I made the curtain for the window when I made the curtain for the appliance garage. If anyone has any good ideas for those shelves next to the window please share. I used to have little teapots up there but it looked so busy. I thought about putting little herb pots there but I haven't found any I like yet. Here's the wall opposite the sink. To the left you can see our downstairs bathroom and further back is our office/playroom. The kids and I made the EAT from MDF letters from Hobby Lobby. I want to hang a chalkboard on the wall to the left of this doorway. I am just waiting for the perfect old frame to cross my path. Overall, I am very happy with the changes we've made. I still wish for my dream kitchen but I am also happy to wait another few years. Does anyone else have any "good enough for now" rooms? What an amazing transformation! I really like the dark cabinets on the bottom and the white ones on top- looks very custom! It's amazing what paint can do! I like the wallpaper, too and the little curtain by the appliance cupboard on the counter. I painted my oak cabinets a few years ago and even though it's not my dream kitchen, I'm still happy with the results. It's fabulous! ALl your hard work paid off! It looks great! We painted our cabinets a few years back and love them. It took us a little longer than we wanted it to, also! Cute kitchen and thanks for joining the party. Look so fresh! And great job on that pendant. We also just installed pendants (and by 'we' I mean my husband. :) I'm too scared to do it myself, so kudo's to you!) We, too, want to paint our cabinets white but I'm just so nervous. Really lovely. Hi there! I found your post/blog from a picture on Google! So glad I did. I'm having a hard time committing to painting my oak cabinets black. I think I'll like it, but the guy at Lowes told me today that I definitely won't get a smooth finish because of the oak. Did you run into this problem?